Product prices and availability are accurate as of 2019-04-19 13:53:06 EDT and are subject to change. Any price and availability information displayed on http://www.amazon.com/ at the time of purchase will apply to the purchase of this product. PneumaticPlus Standard & High Flow Filter-Regulators, or "Piggybacks" combine the functions of both a filter and regulator into one unit. Piggybacks are compact and most effective when space is constrained. Bowl options (Metal or Polycarbonate) as well as drain options (Auto or Manual) are available. SAW Series Filters use a 10 Micron Element as the standard element, and offer 2, 5, 20 and 40 Micron Elements as available options. Also Piggyback units with a Coalescing Filter element are available: SAWM with a 0.1 Micron fiber element and SAWD with a 0.01 Micron fiber element. Please search PneumaticPlus "SAW PneumaticPlus" in the Amazon Search Box to see all available options. Pneumatic devices are designed to work at a certain pressure. Most devices will operate at pressures in excess of that recommended. However, operating at higher pressures can cause excess torque, force and wear, and can waste air supply. The best operation and life of the device can be obtained by using the proper pressure level. 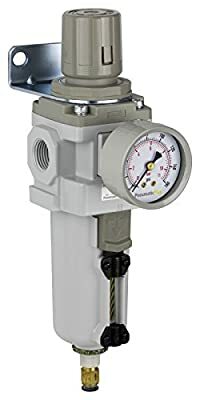 A regulator is used to reduce and maintain the pressure at a level suitable for the device. Please visit our Amazon Store for our complete line of air products. DO NOT INSTALL A POLYCARBONATE BOWL IN PRESSURES THAT EXCEED 150 PSI OR WHERE THERE IS A PRESENCE OF SOLVENTS HARMFUL TO POLYCARBONATE.